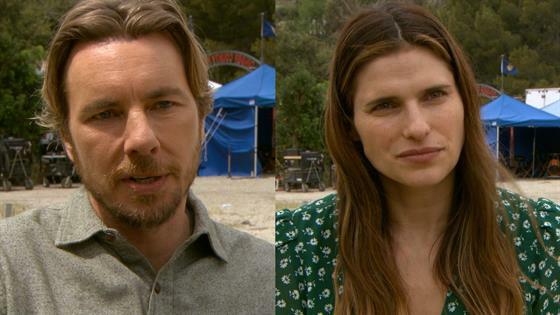 Dax Shepard and Lake Bell are trading city life for country life on Bless This Mess, and it's a big change not just for the characters, but for the actors themselves. "I'm doing a lot of weird things I've never done in real life, like bathe chickens, and care for them," Shepard told E! News when we visited the set of the new ABC comedy. "Lotta chickens in this show!" "We are shooting very much entrenched in beauty every day, and I think it does something for our spirit here on Bless This Mess," she says. "It's good for the soul, good for the heart. We're creating something that's very kind-spirited and very generous in our sort of love for humanity, and I think that being in nature definitely feeds into our stories." Shepard also happens to be married to a pretty famous TV star, and since he's guest starred on The Good Place, it's only natural to expect that we might see her show up out on the farm one day. Shepard says that's not likely to happen, but not for the reasons you might think. "I'd love to have her on, but the problem is is when she's on, I'm gonna want to kiss her," he says. "We have kind of a pattern of me hitting on her and things and it not going well, so who knows? Maybe. I'm married in this one. It's very tricky!"